I bought a Aussie in March 10-07, I thought I done a good job checking breeder and I got Splatter in Mo. Splatter was very ill and when he went to the vet they told me he was not healthy and that night he had a seizure. I called the breeder and she knew this pup was sick and she just was nasty and told me she would call me back and I never got that call. Splatter was seizing every two weeks and we love him so much and to watch your baby go through this and nothing helping. We done acupuncture and meds and his new vet was just was so wonderful and he cared so much about Splatter, he call him his pup his son my boy. I just loved Dr Nickles for the love and care he give him. But this last Oct 15-09 splatter started seizing and seized for four days and the vets works so hard to save him but they could not stop the seizures.I told my hubby my baby has had enough, and Doc talk to my hubby and I told them it was time to let him go. He was so bad he didn't know what he was doing. So we meet Dr Nickles and I was with my baby for a hour and I loved and kissed him and just held him so tight. And Splatter was not a licker and he looked at me and he give me a big lick right in my face. He was telling me he was ready to leave me. I looked at the doc and he give him the shot, and I told splatter I was so sorry that mommy could not make him well and he was gone. I layed my head on him and just cried so hard. Dr Nickles had big tears in his eyes and we all just hugged. 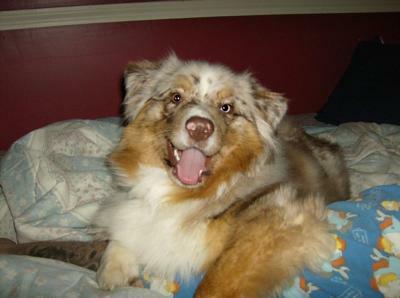 I just couldn't believe my beautiful red merle Aussie was gone. We went out and they fixed him up in his blankie and we came home for his last time. It's been ten months and yesterday Aug 8th was my birthday and my wish was to have my Splatter back, but god had him in good hands, I miss you so much my Bobbie, was is nickname. He was so sick he was never a puppy. He will be in my heart forever. Splatter-Patch. Your story was extremely touching, we have had our new pup Ozzy since February and I just could not fathom enduring such a thing. I sit here with tears in my eyes looking at our three Aussies thankful we are so fortunate. I am so sorry to hear about your dog. Be grateful that you were given the opportunity to love him and bond with him and enjoy him during his brief stay on Earth. The breeder probably would have inhumanly euthanized him if you had not taken him. And shame on her!!! I am so sorry again for your loss..I hope you will find a nice, lovely, healthy Aussie when the time is right for you and your family.You did the kindest thing for your Splatter... and my heart aches for you. Take care. I am so sorry for the loss of your boy. We wet through similar. Our boy also suffered from epilepsy. It started when he turned 2, and we tried for 3 years, from conventional meds to holistic, and we really thought we were doing so much better, wen one night he had a cluster, and never came back to us. he was camatose by the time it all ended 5 hours later. We called around to see if someone (vets) would come to the house to help us, help him, but no one would come. we finally took him to an emergency vet wrapped in a blanket, carried on a board, and there, they had to give him the shot, that would stop his heart, and close his eyes. I've never loved a dog like this. We miss him so much, but we are in the process of getting another, not to forget our boy, to to love another. I pray God hela your broken heart, and that you will be able to love another, again.